Feather quill trivet in brass, also avaiable in our Pewter finish. This traditional feather quill design trivet is cast from solid brass and is a lovely addition to any table. It measures 6-3/8" in diameter and stands 1" high on three rubber covered feet. Weight: 1 pound 2 1/2 ounces. 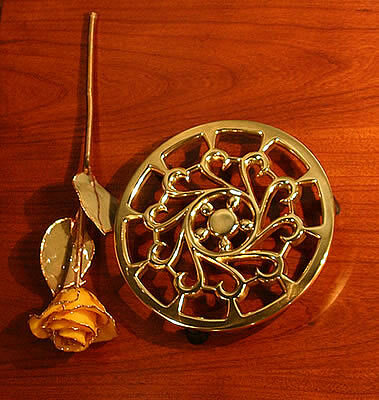 Pictured here in Polished brass, this trivet is also available in our Pewter finish. The brass is lacquered to keep it shining. Comes in an elegant gift box. This trivet looks beautiful on any dinner table, and makes a wonderful hostess gift. I purchased three feather quill brass trivets to inset in a table top for a customer. The trivets are beautifully crafted and arrived in great shape. After some discussion it was decided that pewter finished trivets would be preferrable. I was treated courteously when I phoned to effect the exchange. Those trivets have not yet arrived. I expect they will be as outstanding in pewter as they were in polished brass. Pictured here in Polished brass, this trivet is also available in our Pewter finish. Comes in an elegant gift box. This trivet looks beautiful on any dinner table, and makes a wonderful hostess gift.